‘Necessity is the mother of invention’- goes the old saying. But then why only a few people or start-ups succeed in addressing such necessities? One explanation could be that such necessities or opportunities are hard to identify, but equally plausible explanation could be that not every individual or a group is endowed with skills of addressing those in a profitable and sustainable manner. Even identifying an opportunity, itself, could be deemed as a capability. 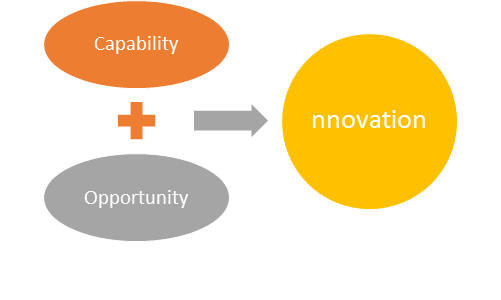 In this article, I propose that capabilities or competencies are equally, if not more, important than opportunities when it comes to innovation. Moreover, I argue that most startups fail not because of lack of opportunities, but in their inabilities to develop relevant and superior capabilities. To being with, let’s try and understand what does a capability mean and where do capabilities come from. As a working definition, a capability could be deemed as a set of well-coordinated routines that offer a reliable outcome. While these routines are often performed by people, across levels, these are mostly embedded in the organization, and are instrumental in giving the startup its characteristics. As an analogy, routines for a firm could be thought of as habits of an individual. Such routines are semi-automatic and are not cognitively taxing, and, hence, lets the organization or the individual focus on more important or higher-order tasks. As an example, brushing your teeth or climbing the stairs to your home are routine activities, and that allows oneself to think of things other than brushing or climbing (such as checking WhatsApp). For firms, routines release human labour from the trivial to then focus on the vital. While a bundle of routines forms a capability, not every capability offers the firm a competitive advantage. For a capability or competency to be of benefit, it must meet certain criteria, such as inimitability, scalability, and of being valuable to the customers. Inimitability, Does it Lead Anywhere? As the first condition, inimitability refers to being superior to the competitor to an extent that others can’t merely copy it and undo your learning curve. This calls for erecting entry barriers for the new comers and an imitation barrier for the incumbents. Since the capabilities are embedded in the firm, they aren’t easy to copy. For instance, even after so many books written about Toyota on its quality practices, Google on its people competencies, and Apple on its design abilities, hardly firms have been able to replicate the success. The causal ambiguity, or the uncertainly as to what leads to what deters the competition from making any serious inroads. Amazon, for a long time now, has remained largely inimitable in its customer service capabilities, which the company keeps pruning with technological progress. The second aspect of a competency being of value to the firm is its scalability. Which means that if a set of routines works well only for a given product in a specific market, and that too, under a certain leader or a team, then it can’t be thought of as a capability of any consequence. Being scalable requires the competency to be agnostic of the context, and hence offering the firm the desired potential to address newer opportunities. For instance, if one of the competencies of Unilever in India is to build strong brands and offer deeper penetration in the market, the benefit should be felt by not only the existing battery of products but also the newer ones, and in newer markets. Only the capabilities that can travel across contexts are of avail to the organization, for that’s how learning takes place and a culture gets built. Another firm that has managed to create and capture value across multiple markets and products is Google, and the capability at hand is minimalistic design. Finally, if the capability is of a limited value to the customer, the focal firm can’t draw much advantage from it either. For instance, if one argues that one of the capabilities of Harvard Business Review is to attract a diverse set of authors, it is a capability of relevance only if the readers of stories feel the richness of the experience and expertise. Customer value is the ultimate test of where to spend and what to protect from erosion. It’s the sheer ability to add value to the customer, that Netflix has travelled all the way to India and created a new market for itself on the strength of its subscription business and recommended content. Hence, any important capability should not be easy to copy, should be product and market agnostic, and should be valued by the customer. So much for the capabilities, now let’s move on to the opportunities. Are opportunities given or are they created? I reckon that opportunities are created, more so when the playing field is getting levelled and the access to information is being democratised. One can primarily think of three means of creating opportunities- adopting new technology to solve an existing problem, delivering a new value with an existing technology or product, and creating a new value with a new technology altogether. The rapid advents in technology allow us to solve long standing problems in some of the most elegant ways. Whether it is healthcare (the case of insulin pens), or travel (online reservations), new technology has largely simplified life. The science is in, firstly, identifying a piece of the problem which is solvable, and then scouting for the right technology which is both feasible and viable. If the technology is generally available and not patented, such opportunities are relatively easy to create. Look, for instance, how so many of the intermediation problems are addressed by startups using the power of the Internet. However, 3M remains as one of the biggest proponents of applying science to solve problems in a very elegant and robust manner. The second means of creating an opportunity is by identifying additional value by leveraging existing technologies. The best example at hand is the smartphone. From being just a phone, layer by layer, individuals and firms have added benefits to the device, and has eventually made it a universal extension of human body! Taking a selfie, or a flashlight, or even a voice command weren’t problems to be solved, but are the features and values to be created. Alibaba, with its range of offerings from payments to product listing, financing, and chats, remains as one of the biggest explicators of this model. Lastly, and perhaps the most challenging one, is where a new technology creates a new value altogether. Think of the blockchain technology, or the idea of distributed ledger with applications ranging from banking systems to healthcare and blood banks. Or, for that matter, 3D printing which has its usage in domains right from space exploration and toy making, to medical implants. Many such technologies are fast getting democratized and the value is in finding use cases and creating means of value appropriation. It is just to depict that opportunities are to be sniffed and addressed, and not to be waited for. So, what comes first- Capability or opportunity? I deem that those with capabilities can create opportunities and would be far better positioned to explicate value even in plain sight. In other words, before your look outside, look deep within and identify what’s that you have which is largely inimitable, scalable, and valuable to somebody. Opportunities will follow.